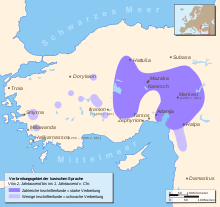 Distribution of the Luwian language, shown in purple. The Çineköy inscription is a Hieroglyphic Luwian-Phoenician bilingual inscription, uncovered in 1997 in Çineköy, Adana Province, Turkey (ancient Cilicia). The village of Çineköy lies 30 km south of Adana. The inscription is dated to the 8th century BC. It was originally published by Tekoglu and Lemaire (2000). Another important inscription of the same type is known as the Karatepe inscription, which was known earlier. Both of these inscriptions trace the kings of ancient Adana from the "house of Mopsos" (given in Hieroglyphic Luwian as Muksa and in Phoenician as Mopsos in the form mps). He was a legendary king of antiquity. The object on which the inscription is found is a monument to the Storm God Tarhunza. The inscription was authored by the man known as Urikki in Assyrian texts, which is equivalent to War(a)ika in Luwian. The question whether it is the same person as Awar(i)ku of the Karatepe inscription or a different one remains debatable.. He was the vassal king of Quwê (Assyrian name), the modern Cilicia. In Luwian this region was known as 'Hiyawa'. In this monumental inscription, Urikki made reference to the relationship between his kingdom and his Assyrian overlords. The Çineköy inscription was the subject of a 2006 paper published in the Journal of Near Eastern Studies, in which the author, Robert Rollinger, lends support to the age-old debate of the name "Syria" being derived from "Assyria" (see Etymology of Syria). The Luwian inscription reads "Sura/i" whereas the Phoenician translation reads ’ŠR or "Ashur" which, according to Rollinger (2006), "settles the problem once and for all". Also, in the Phoenician version of the inscription, Awariku claims to have built 15 fortresses in his kingdom. In the Luwian version of the same inscription, the same sentence is misinterpreted as a reference to destroying fortresses. Wikimedia Commons has media related to Çineköy bilingual.